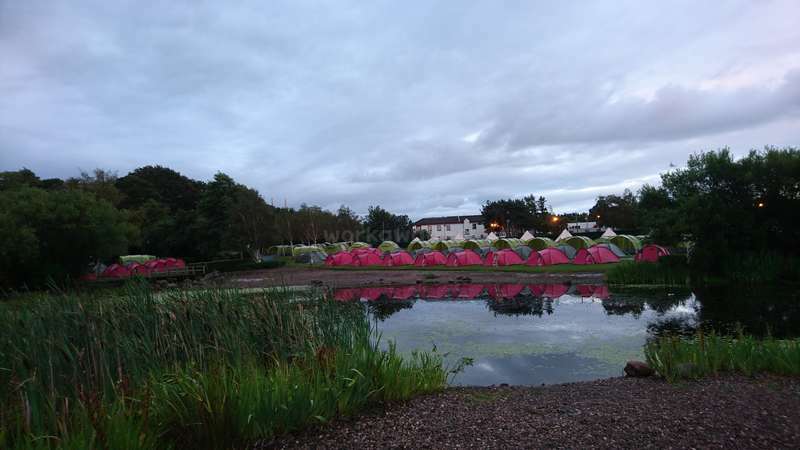 We are a temporary campsite company who specialise in temporary accommodation at major world-class events. 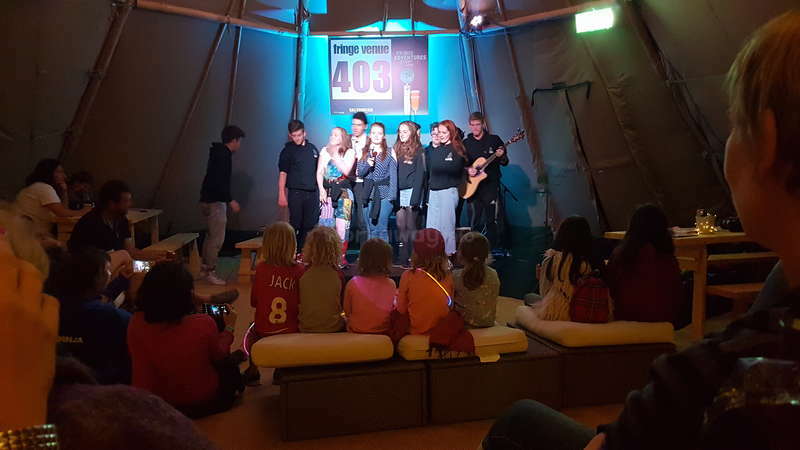 Each year, we build a campsite for the Edinburgh Festivals, the world's largest performing arts festival, and our awesome Helpers Programme enables people to come and help out in exchange for free accommodation. 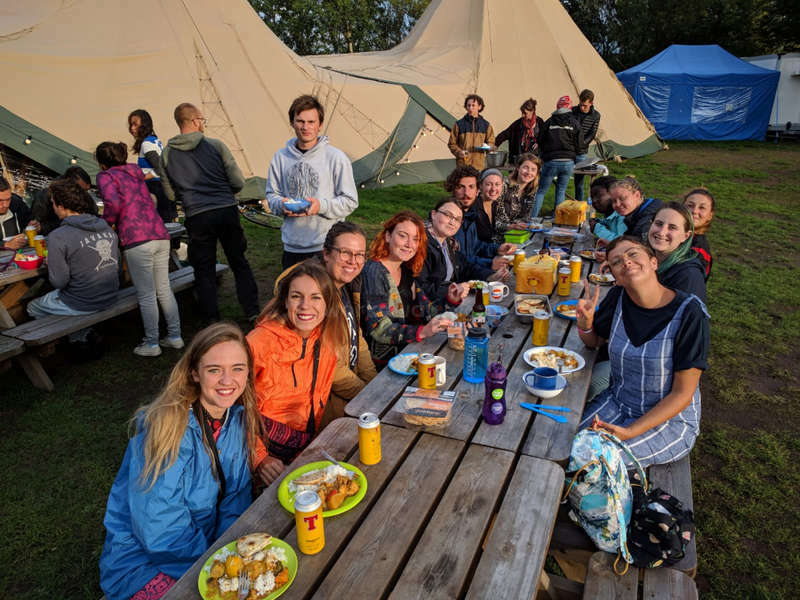 We attract helpers of all ages and from all over the world so it's a really great opportunity to meet other travellers, get work experience, practise your languages and be a part of creating an awesome campsite. Each year we have about 70 helpers with us over 4 weeks from all over the world - I think we've hosted people from over 30 countries now - including Europe, Turkey, the US, Mexico, South America, Taiwan, China, Australia and New Zealand. We ask for 4 hours help per day in exchange for your free stay and we can provide tents, air beds and bedding where needed - please let us know! Breakfast is included and we provide additional facilities for helpers, including cooking facilities for lunch and dinner and exclusive helper hang out areas. 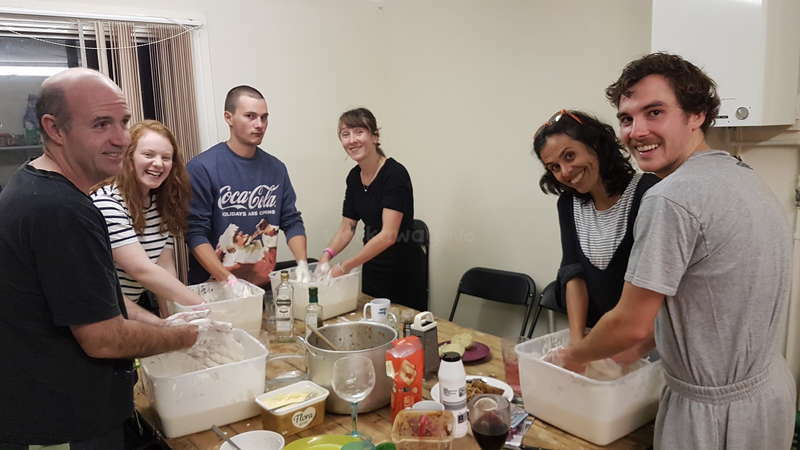 We host regular helper's evenings where we cook together and enjoy a few beers, and we'll always do our best to join you for a friendly beer in the evenings too! Helpers are welcome to join us from 27th July to 28th August 2019. We would prefer helpers to join us for the full four weeks, but helpers can stay for a minimum of 14 days. Workawayers will help with the creation and taking down of the campsite, putting up tents, customer services, campsite maintenance, cleaning and getting creative with chalk boards and signage wherever possible! If you haven't been to the Edinburgh Festivals before, they are 4 weeks of back to back theatre, music, comedy, art, dance and literary festivals. It is massive! There's the Free Fringe - a huge programme of free Fringe theatre, and the International Festival boasting the best in the world. Edinburgh itself is a beautiful, historical and culturally rich city with easy access to beaches and walking paths. We are friendly and welcoming, hard working and relaxed. We love to have a laugh and we appreciate each other. 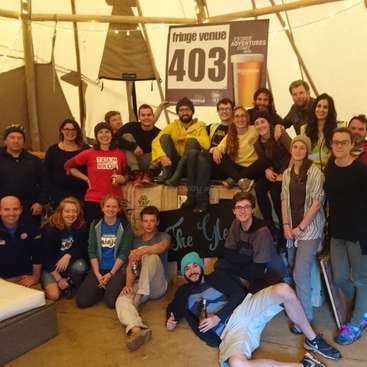 We are now in the 5th year of our helpers programme and have hosted over a hundred helpers from all over the world, creating a fun community of like-minded people in Edinburgh and other venues. If you are interested in joining us for this event, please get in touch and we will gladly discuss further details with you. Experience. The experience you can gain at our campsite could help you if you would like to build your C.V. around tourism, event management and festival work. Our campsite will give you an insight into what is required to put on and run a festival campsite. Previous helpers used their spare time to visit the festivals which they then used to assist in their studies and practise journalism. Language. If you would like to practise your English, or if you are a native English speaker and would like to practise other languages, this is the perfect setting. We receive guests from all over the world, so there is plenty of opportunity to speak English or other languages. Travel. Nothing quite gives you an insight into a city than living alongside and helping other tourists. Whether you intend to stay for the minimum period or for the whole duration, helping at the campsite is a great way to get to know Edinburgh. Helping other visitors find their way around, offering them advice on public transport options and just being friendly and chatting with them about shows, venues, cafes or restaurants worth visiting and places to explore, you will quickly feel like a local and get the best tips on where to go and what shows to see. Culture. Scotland has an amazing history and a strong cultural identity; anyone who has been to Edinburgh before will tell you how wonderful a city it is and how easy it is to be absorbed by it's history. Then during the festivals, Edinburgh is brought alive by the multi-cultural festivals, street performers, theatre, music, dance, comedy and so much more. We are lucky to be able to be a part of this as we accommodate visitors and performers. 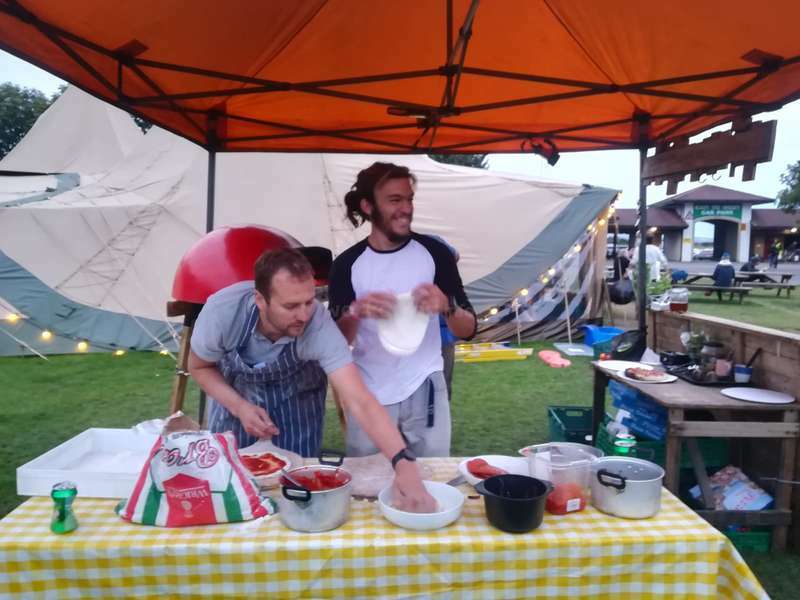 Our campsite has a wonderful community spirit and staying here will give you the opportunity to meet some amazing people from all over the world. And being just 25 minutes from Edinburgh city centre, where thousands of performers come together from around the world, there are few better places to see so many cultures in one place. Help required will include campsite maintenance, putting up and taking down tents, marking pitches, cleaning tents, customer services (checking in guests and providing information), helping in our cafe and bar, campsite maintenance including cleaning bathrooms and litter picking. Cet hôte offre l'hébergement et une rémunération. We are located on a large campsite will all the facilities you need and some wonderful people to chat to about life, the universe and everything. Tents and bedding provided, just let us know! We will have helpers returning to work with us for the 5th year running, and we are so proud of the family unit and community that we develop and build upon at each of our events. We believe in looking after each other and ask everyone to do their bit so we can all have a great time! We love taking on helpers (who are always the nicest people!) and having the opportunity to learn new things and improve our understanding of different cultures. We really appreciate our helpers, and we strongly believe that we should all be having fun whilst we work. I spent the whole month at the campsite and I really had fun there. I met so many people from all over the world, and I fell in love with the campsite. You are with around 50 volunteers like you, and the staff is very friendly. Of course some shifts are better than others but you are involved in every aspect of the camp (maintenance, check-in,… read more bar...) so you can see the whole operation of the campsite, very interesting.It is only 4 hours of work every day and then you have a lot of time to visit Edinburgh, and every night you can go to the tipi (the bar) to see performance of some artists of the Fringe Festival. I had a great time during my stay in Edinburgh. I made a lot of friends and saw fantastic shows on Fringe Festival. The team at the campsite is very friendly. You're supposed to work 4 hours a day and everyday you've got diffrent jobs (basically it's cleaning, working at check-in or at the bar). The best place to stay during the Fringe! Of course,… read more don't forget that Scotland is not far to be a polar area ;-)) that means the nights can be really really cold, and the days really rainy, even in summer, get prepared before coming! The staff of the camping is really kind and well organized; you always know your shift the day before. The only thing I didn't like too much was the absence of free days since we had to work 4 hours/day 7days/7 ; and I got only 1 free day during my 2,5 weeks stay (that I spent in Glasgow, a really enjoyable visit!). You can go to the center of Edinburgh in 40 minutes by bus to enjoy this beautiful city and this impressive festival! But you can also stay quietly in the camping and spend a good time with the other volunteers and enjoy the free shows in the bar during the evening. It was a lovely time at the campsite! The work was alright, I mean, its only 4 hour a day, so I'm not complaining. ;) The cleaning shifts are never a pleasure, but they is so many other stuff to do. Like working at a bar or the check in. They really try to give you a variety. I'm so happy that I was a part of the crew! I met so many lovely new… read more people and learned a lot about the scottish culture (haggis). The Fringe Festival was a amazing festival! So many shows to see! And you find always a person on the campsite who joins you to a show :) Edinburgh is a beautiful city and it was only 30.40 minutes away. In August hostels in Edinburgh are so expensive. So it was a good alternative to work at the campsite, to enjoy the visit when don't want to "waste" so much money for a accommodation. Ben and Akela are absolutely fantastic - we absolutely loved having you, Caden and Chloe with us, thank you so much for your contribution, kindness and positive attitudes. Very willing, capable and independent people - highly recommended. We hope we see you in the future! Thank you so much for joining our campsite in August 2018. We really appreciated your positive attitude and willing to get stuck in and help out with whatever was needed. 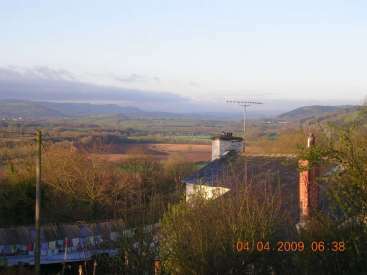 We'd love to see you again and would recommend you highly to other Workaway hosts! Thanks Merle! It was my first experience with Workaway, and it was just amazing ! I met so many people, who came from everywhere. I spent really good time at the campsite, with the other workawayers and mostly with the organizers. They were very friendly and adaptable concerning our activities outside the campsite. The best way to improve our foreign language… read more and to enjoy in the same time the Edinburgh Fringe festival ! Thank you so much ! It's difficult to explain what we felt during our stay in Edinburgh at this campsite, so we will just say it was marvelous. The job, easy and funny job; the location, better impossible (you don't want to know what finding a place to stay in Edinburgh means, especially during the Fringe festival); the People, simply the best. Thank you for… read more everything you gave and shared we us, thank you for doing what you do. Javier and Patricia are the loveliest people! We were lucky to have them stay with us on our campsite for a couple of weeks, and they were both always willing to help and always smiling! Thank you both - good luck with your travels! Had a brilliant time with the Camping crew. Really no complaints at all. In terms of facilities, it was basically like living at home, with every comfort a road weary traveler could desire. Although, however marvelous these were, they paled in comparison to the company. No matter what time of night or day there was some lovely person around,… read more making a brew or messing around with a guitar, always willing to spare a few minutes or so for a chat. I would absolutely recommend this experience to anybody. Peter joined us on our festival campsite for almost all of August, and was a brilliant asset to our team, friendly, laid back, and always willing to help. 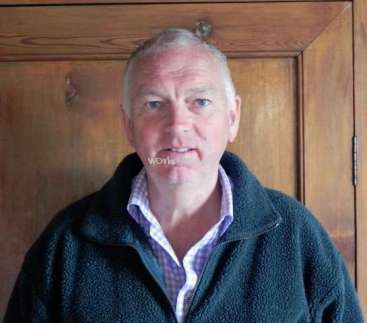 We'd highly recommend Peter - he's a lovely guy and it was great to get to know him and work beside him this summer. We hope we see you again! I spent about a month in the campsite. All the volunteers work 3 hours per day, this give me the opportunity to visit Edinburgh and enjoy the Fringe. Beautiful atmosphere, is an unique possibility to meet amazing people from all over the world. I'm very glad to have known all the staff group! All of them are lovely people,… read more professional, always available to help you in any possible way...so thanks for all! Lorenzo came to join us on our campsite for almost all of August, and was a brilliant addition to our team. Lorenzo is laid back, mature and very capable. I hope that you enjoyed it as much as we enjoyed hosting you. All the best for your studies Lorenzo, and thank you again for your help! Stefanie stayed with us for two weeks in August at our festival campsite in Edinburgh. She was a brilliant addition to our team, friendly, intelligent and very capable. She learnt our processes very quickly and was excellent at customer services and the maintenance required on our campsite. We'd highly recommend her. Steffi, thank you for joining… read more our team - we hope you enjoyed it, we loved having you. Hopefully we'll see you again! I spent three weeks this summer at the Campsite right outside of Edinburgh and it was marvelous! I was working with the best team (and by team I actually mean family!) and I hope I will find the time to come back again next year. It was my first workaway experience and it set the bar very high for all the workaway to come. Working for three hours… read more a day gave me a really good opportunity to explore the area and spend time with my new friends. It was never a problem to change the shift if you had something planned and I really enjoyed working in an international team with international customers. 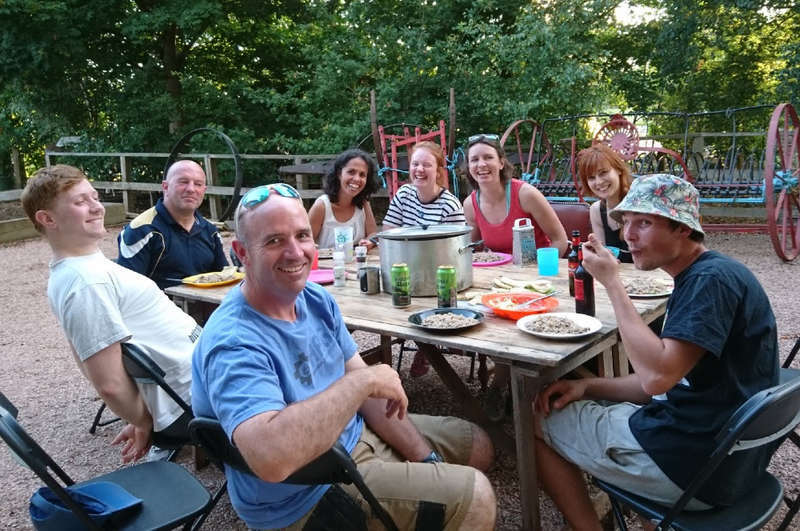 I would like to thank the great Camping Team – Rhian, Geoff, Sarah, Adele, Marine, Justin, Davie, Glen and Phil – working with you really didn´t feel like work at all! Peru joined us at our festival campsite for the whole of August and was such an asset to our team. Peru is friendly, helpful, laid back, a great musician and lovely person. Peru, we hope you enjoyed your stay with us and that we'll see you again in the future. All the best! I spent all month of august volunteering in this campsite, and I have to say that it was a wonderful experience. I met volunteers from all over the world, open minded and welcoming people. Alltogether we created a community that, according to the relatively short period of time we had to know each other, most nearly can resemble a family. Despite… read more the tropical, super-hot dry weather (*️), the vibe in the camp mantained itself as cool as it could have been. Great facilities, and most of all, very professional yet good hearted and honest (even inspiring) staff members, that did all that was on their hands to make our stay worth it (by far), both for volunteers and campers. I really enjoyed both my free time and shifts there. Thanks a lot to Rhian, Geoff, Sarah, Marine, Adele, Justin, Glen and Phil. It was a real pleasure to meet you guys. Hope to see you next year! Joao came to join us on our campsite for the whole of August this summer, and he was an awesome addition to our team. Joao is friendly, laid back and always happy to help. It was great having you Joao, I hope you enjoyed it! Thank you again for your help! What a great guy. Mark joined us on our campsite this summer, and he is friendly, laid back and was a lovely addition to our team. Thanks for joining us Mark - it was great hosting you. We hope you had an amazing time for the rest of your travels. Aina joined us at two events this summer and was an absolute delight to have around. Aina is friendly, funny and willing to work, and she got along great with the rest of our team. Thank you for joining us, we hope you enjoyed it as much as we enjoyed hosting you! 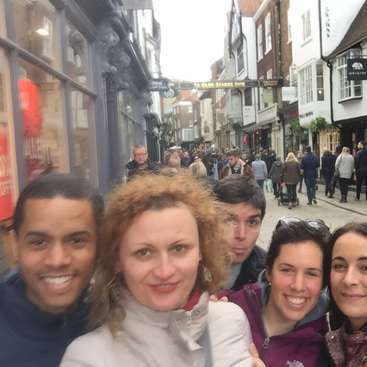 Carlota joined us at one of our events near London, where she worked in exchange for accommodation and meals. Carlota is friendly and kind-hearted, fun to have around and happy to get work done. Carlota, we hope you enjoyed your stay with us and that you'll continue to have wonderful experiences with Workaway. Thanks for joining our little team! Cornélia joined our team at our Edinburgh festival campsite in Edinburgh, and she is a delight to have around. Cornélia is friendly, very funny and very capable, and it was great to have her be a part of our team. 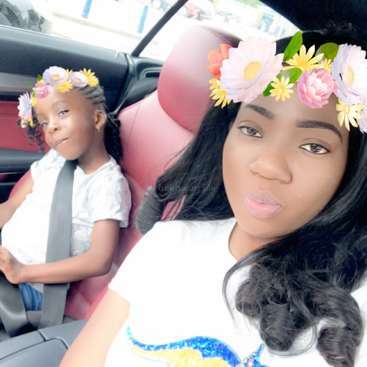 Thanks for joining us Coco, we hope the rest of your summer and your exams went well! 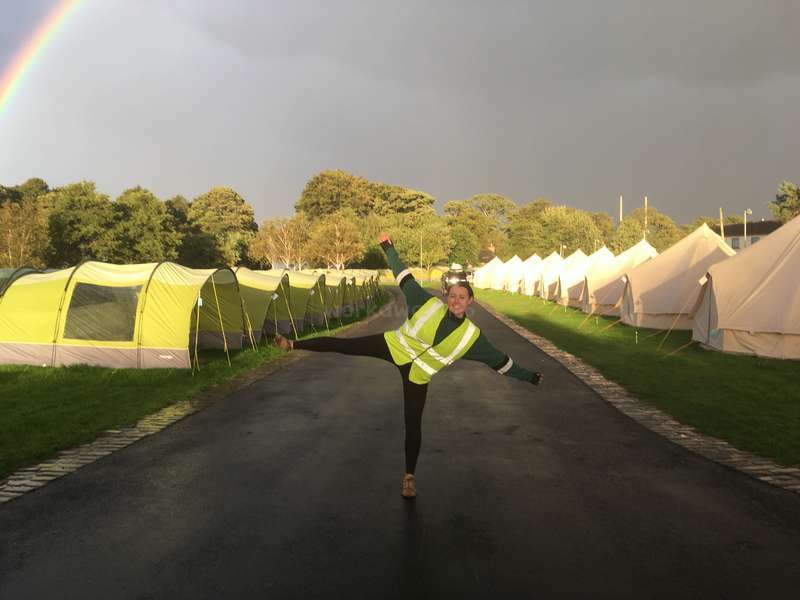 Eva joined us on our Edinburgh festival campsite in Edinburgh this August for a couple of weeks, and it was lovely to have her be a part of our team. Eva is friendly, intelligent and very capable, and it was lovely to get to know her and have her as a part of our team. We hope you enjoyed the experience and that we'll see you again! Robyn joined us on our festival campsite in Edinburgh for two weeks, and it was lovely to have her be a part of our team. Robyn is friendly, intelligent and very capable, and it was great to have her with us. Thank you for joining us! We hope you enjoyed it all! Cat joined our team at our festival campsite in Edinburgh for just over a week, and was really helpful, friendly and happy to get on with the task at hand. Cat is friendly, helpful and laid back, and it was lovely to have her with us. I hope you enjoyed your stay with us! Thank you again! Aradia came to help us on our campsite in Edinburgh for nearly two weeks. She is friendly and helpful, and it was lovely to have her be a part of our team! Thank you for joining us, we hope you enjoyed your stay! We got to know Katie when she came to join us for 10 days at our Edinburgh campsite, and she was brilliant. Katie is very capable, intelligent, and willing to turn her hand to any task required. She performed a variety of roles with us including customer services and cleaning across our campsite. She is polite, tidy and respectful and a… read more considerate and interesting person. Thank you for coming to join us, we hope you enjoyed your stay as much as we appreciated having you with us. Good luck on your future travels! 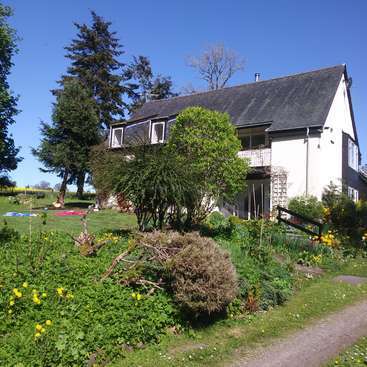 I did my first workaway here near Edinburgh and it was a great first experience! Sarah was very responsive in providing me information about how to reach the site and all the specifics. The team at the campsite were kind and welcoming. They distributed the different tasks fairly and working times were varied as well so there was always time to go… read more into the city and see shows and explore. The other workawayers were nice and since there was a large group of us it was great for making friends and doing things together. They also have a volunteer night where you get a great home-cooked meal and free beer :) There were facilities for cooking, hanging out, clean showers and toilets and the tents were leak proof and each person had their own tent. I'm happy to have had the 11 days to experience the site and my first visit to Scotland. Highly recommend them. Thank you again! Julian came to join us for the last couple of days while we were packing down our temporary campsite and was a real help to have on site. Julian is a lovely guy and got stuck in right away. He really helped us out in these last days as we took down giant tipis and packed away a month's worth of camping equipment into our container. Thank you so… read more much for coming to join us! Anika came to join us on our campsite for the last few days when we were closing and was a wonderful addition to our team. In the few days that we spent with Anika, she proved herself to be extremely capable and smart, outdoorsy and willing to just crack on with the task at hand. Anika was really helpful and just lovely to have around - thank you… read more for joining us! We hope we see you again! Daniel came to join us on our campsite for just over a week and was a wonderful addition to our little volunteer family. Daniel is extremely helpful and a gentle soul, and just got on with whatever was asked of him. Thank you for choosing to join us, and we hope you enjoyed staying with us as much as we enjoyed having you! Doris came to join us on our festival campsite for just over a week and was brilliant. Doris is upbeat, friendly, smart and full of energy; it was really great having her on our campsite, helping cleaning, doing customer services or any tasks that arose. We hope we see you again! Retired professional building a new home. Hoping to get back into gardening both veg and flower. Would be keen to learn and set up some bee hives.